NanoLC-MS analysis with benchmarked and quality controlled systems to ensure a sustained level of performance and with optimum chromatographic gradients and MS modes (DDA, DIA). Bioinformatic processing. We use several software tools installed on clusters and/or multicore servers to process large scale data. Our in-house developed tools (Proline, MS-Angel, mz-Scope) offer an optimized pipeline solution for data handling, processing and inspection. Statistical analysis. We offer support to interpret large-scale proteomic data using state-of-the-art statistical methods and tools, in order to identify differentially abundant proteins and control false-discovery rate. Targeted strategies have emerged ten years ago and are best suited when precise, ideally absolute, quantification of finite sets of proteins are required with highest sensitivity. Targeted strategies are widely applied in the biomarker field as potential biomarker candidates identified during discovery experiments need to be verified and validated on large sample cohorts, sometimes even in a clinical environment. Sample preparation. We can implement various protein extraction methods, as for discovery experiments. Of note is that for a robust quantification, sample preparation should be minimal as each step introduces additional variability. Design and synthesis of heavy labelled standards (e.g. AQUA peptides, PSAQ standards). LC-MS-MS analysis. We use state-of-the art LC-MS/MS couplings, based on powerful chromatographic systems and last generation mass spectrometers that are benchmarked and quality controlled to ensure a sustained level of performance and with optimum chromatographic gradients, chromatographic scales (nano or micro) and MS modes. Proteins are very often the subject of various post-translational modifications (PTMs) that can impact their association with other proteins and globally other biomolecules, their subcellular localization and their stability. Both the protein abundance and the levels of PTMs can vary between cellular states, such as cells submitted to an environmental stimulus or left otherwise, between differentiation states or between normal and diseased tissues. The ProFI teams have developed expertise in the analysis of several types of PTMs, in particular phosphorylations, methylations, acetylations, O-glycosylations, and also in assessing the possible cleavage of protein N-termini to yield the mature sequences. The large-scale LC-MS/MS analysis of one type of PTM usually requires the enrichment of the proteolytic peptides bearing the PTM of interest, by implementing a step of affinity purification. Besides, some PTMs produce specific fragments that can be tracked in MS/MS to pinpoint peptide sequences containing the PTM of interest. The ProFI teams have been developing methods at the two levels to increase the specificity, sensitivity and thus coverage of the proteome bearing the above PTMs. PTMs investigations are also based on our strategies and instrumentation for large-scale and targeted quantification. Proteins mainly act in association with other proteins in a dynamic way to reach a tight control of cellular processes. 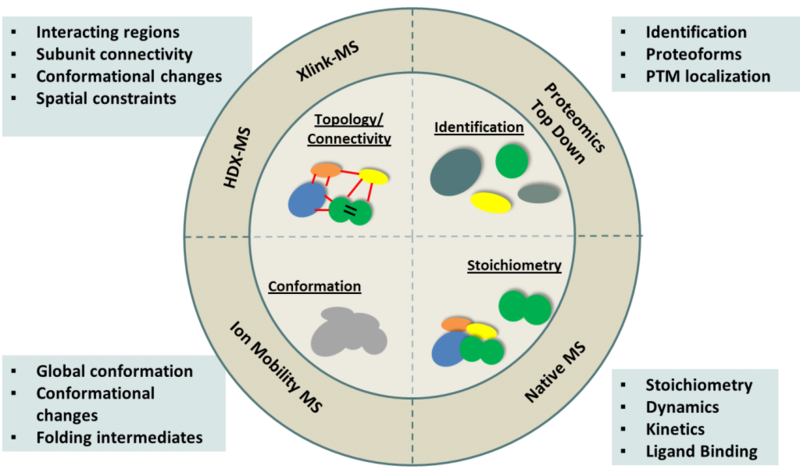 To address these issues modern mass spectrometry-based proteomics strategies are combined with efficient biochemical approaches, like affinity-purification methods. We have expertise in interactomics, ie the analysis of protein complexes and protein networks, in a qualitative and quantitative manner. 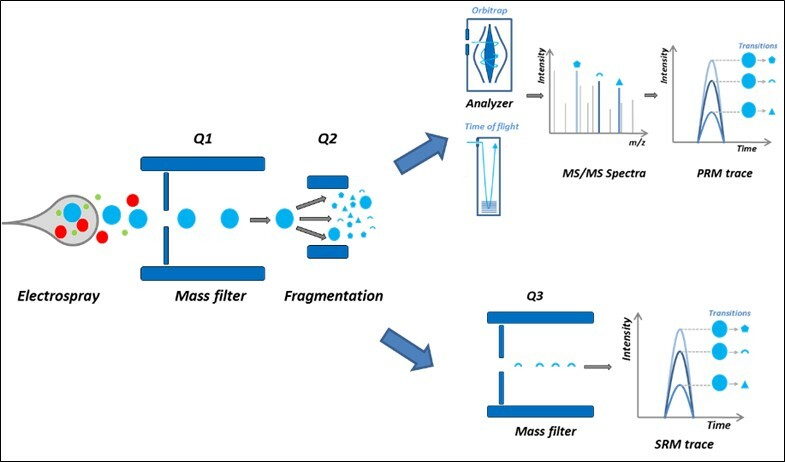 We apply affinity-purification approaches combined with quantitative mass spectrometry analysis (AP-MS) to identify proteins associated to a bait protein of interest. Depending on the sample and the bait protein several purification methods can be applied (immunopurification of endogenous proteins, affinity-purification of tagged proteins using various tags). In any case, a relevant control experiment is conducted to distinguish contaminant protein associations from true interactors. Differential quantitative proteomics analysis between the bait and the control assays then allows the identification of specific protein partners of the bait protein. The ProFI teams have been developing strategies to maintain labile interactions in vivo using crosslinking agents, to analyze specific interactions across various samples using abundance correlation profiling, to cluster proteins with similar dynamics. Protein complexes and interactomics investigations rely on our quantitative proteomics strategies and instrumentation used for large-scale and targeted quantification. The next frontiers in proteome research are the study of protein-ligand interactions, protein-peptide and protein-protein complexes, together with entire protein interaction networks by high-throughput methods. 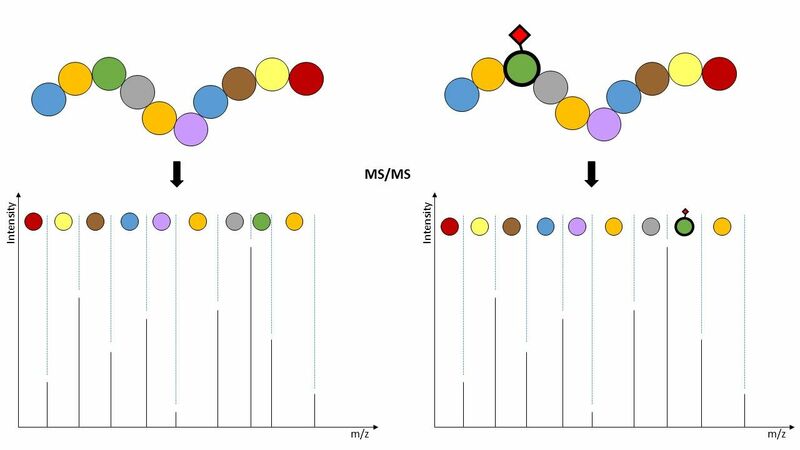 Structural MS is a quite recent research area that consists in deriving structural information from MS based data and usually focuses on highly purified proteins or protein complexes, most of the time from recombinant origin. 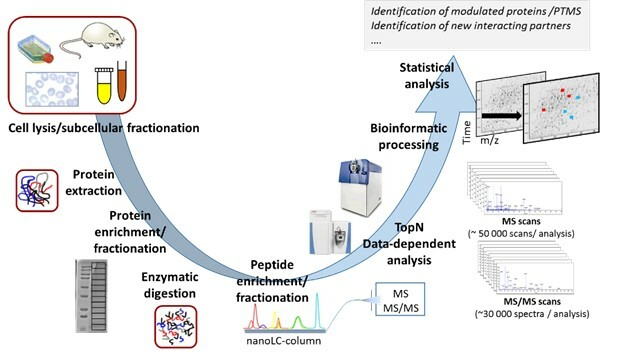 ProFI is a national infrastructure developing methodological innovations in the field of proteomic analysis, particularly in data processing (Proline link). ProFI offers a service to the scientific community, from academic or private sectors. ProFI provides its expertise (trained staff and advanced instrumentation) for the realization of projects requiring proteomic analyzes. The ProFI infrastructure proposes its services in collaboration or as fee-for-service. Collaboration: concerns analyses that will be carried out in a context where intellectual property is shared. For these two service offers, depending on the scope of the request, either a contract (e.g. ANR projects, INCa etc.) or a quote with an invoice will be established. For any request with a quote, this one will be issued by one of the ProFI sites, signed by the customer and accompanied by a purchase order before any realization. The rates applied are specific to each type of offer and will be the subject of an estimate. If a given ProFI platform is chosen, the request will be taken into account directly by the manager of the platform concerned. Otherwise, ProFI platform managers will come back to you to offer you a ProFI platform, according to the expertise and schedule required. The request is validated, or invalidated, by the platform managers and / or the ProFI steering committee. When a request is validated, a project manager is appointed and takes charge of carrying out the analysis, up to the results report, which can be made available on the ProFI customer area (secure access). 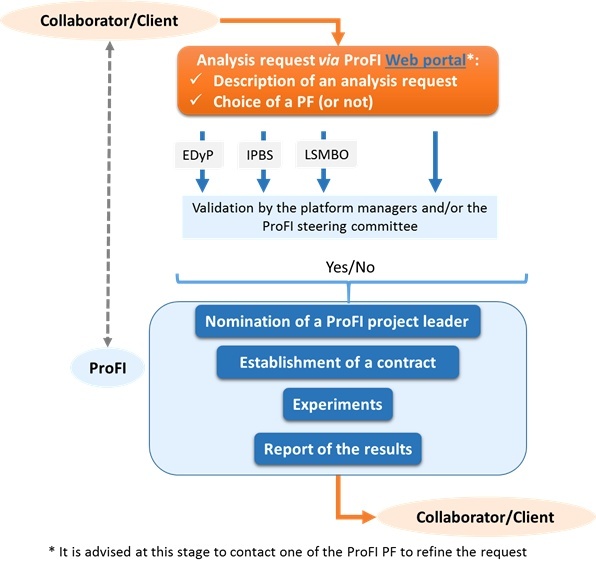 A discussion with a platform manager in order to assess the feasibility, to plan the optimal experimental plan is recommended before any project acceptance. This work was supported by the French Proteomic Infrastructure (ProFI) ANR-10-INBS-08-03.